With Thanksgiving break approaching and my return to the Midwest on the horizon, my food shopping for last week was scant. In an effort to reduce wasted food and the precious green paper in my wallet, I made a small grocery list and tried to survive the week. To say it was a week of leftovers would be an understatement. It was more like a week of scraping out my refrigerator and cupboards for bits of food I could compile into a meal. Was it enjoyable? Not really. Was it cost effective? Yes. Luckily, my super frugal mentality lead to this creation. This dish is as easy as it gets and it tastes divine. All you need is some lettuce, one grain/vegetable based burger and one whole egg. It’s also sure to impress should you want invite someone over to join. I picked up a quinoa cake from Whole Foods. You can find them in the pre-prepared section. I’m sure any grocer will have something similar. Black bean, brown rice, chickpea burger – you name it, it will work. Trust me. If you’re a kitchen super star, here is a recipe for quinoa cakes. However, I haven’t tried them so make at your own discretion. On to the main event. Quinoa is a great grain to get familiar with. It’s a complete protein, meaning it contains all nine essential amino acids. Virtually no plant food contains all nine. Animal proteins are always complete, but plant foods – not so much. I was actually pretty impressed with myself after assembling this little number. The quinoa cake was on sale and I needed to eat the cup or two of lettuce left in my refrigerator. Giving you an ingredient list on this one after reading the recipe title seems silly, but you can never be too safe. Poach the egg in water. Place mixed greens on plate. 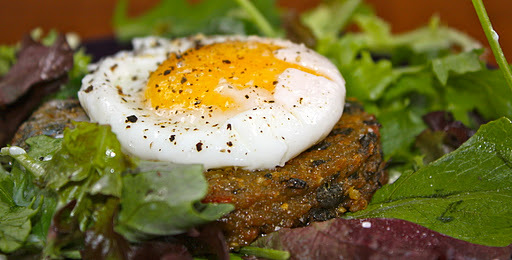 Top with quinoa cake, followed by the poached egg. Crack some fresh black pepper on top and dig in!